Human rights groups are calling for the release of 165 prisoners of conscience in Vietnam. Global civil society organizations (CSOs) have launched a series initiatives to highlight Vietnam’s alarming human rights situation. The NOW! 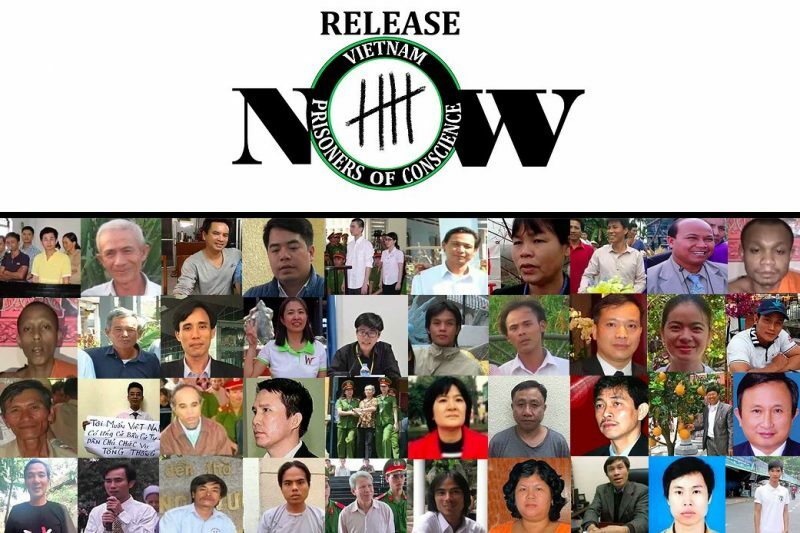 campaign, founded by 14 human rights organizations, calls for the immediate release of 165 prisoners of conscience in Vietnam. The campaign has established a comprehensive online database containing information about Vietnam’s prisoners of conscience. According to the database, Vietnam’s prisoners of conscience included bloggers, journalists, environmentalists, students, farmers, and workers who were arrested for their peaceful activism. Together, these men and women are serving 955 years and one month in prison, followed by 204 years under house arrest. Most of them were charged with violating article 79 of the criminal law, “plotting to overthrow the government”, and article 88, “conducting propaganda against the state”. The government’s near total control of media in Vietnam and the secrecy that surrounds the arrests and jailing of certain prisoners of conscience, especially those from ethnic minority groups, mean that it is often difficult to find information about cases of prisoners of conscience and it is impossible to state definitively that all prisoners on conscience in the country have been identified. A letter signed by 17 CSOs urged leaders who attended the 2017 summit of the Asia-Pacific Economic Cooperation (APEC) in Vietnam to raise the issue of human rights violations committed by state forces. The letter informed APEC leaders that Vietnam has detained at least 25 peaceful activists and bloggers since last year. This crackdown is contrary to the goal of “Creating New Dynamism, Fostering a Shared Future” which is the stated theme of this year’s APEC gathering. Arbitrary detention, censorship, and state-sponsored violence against activists and human rights defenders are not only an affront to our common humanity but a grave violation of international human rights laws and standards. We believe it is in the strong interest of APEC and of the international community to speak out against the widespread and systematic violations of human rights violations in Vietnam. Meanwhile, Nguyễn Bảo Nguyên, daughter of detained dissident blogger Me Nam (Mother Mushroom) wrote a letter addressed to Melania Trump seeking help in securing the release of her mother. The United States First Lady joined President Donald Trump in Vietnam during the APEC summit. I’ve read on the social media and knew that your family will be visiting Vietnam during APEC summit. My birthday is only a few more days away. It’s going to be another birthday that my brother Gấu (Bear 4-year-old) and I will have to be without my Mom. We love Mommy very much and just want Mommy to be home with us. Nine human rights groups launched the #StopTheCrackdownVN campaign decrying the crackdown of bloggers and activists in recent months and the harsh prison terms handed out to critics of the state. The law also allows authorities to filter, block or temporarily shutdown networks on the basis of any information that may be seen to “incite” mass gatherings that disturb national security and order. Given the Vietnamese government’s broad interpretation of national security, we might expect to see more attacks and shutdowns aimed at independent media and bloggers and arrests of peaceful community mobilisers. We urge the Vietnamese authorities to immediately release all those detained in connection with their exercise of their rights to freedom of expression, and to amend the overly broad ill-defined laws that are used – under the pretext of national security – to crack down on dissent.